Are you interested in starting a career at Solar Transport? At Solar Transport, our customer partnerships are based on trust and integrity. Your operation and business objectives are unique, which is why we design custom solutions that make sense for your company. We provide the complete package, from fleet support to inventory management, using custom logistics to give your business a competitive advantage. Providing fuel to 12 states across the nation, Solar Transport has a footprint from California to Arkansas. With our innovative technology, a job with Solar Transport means efficiency and productivity each and every haul. Once a customized plan is in place, Solar Transport becomes an extension of your operation. Our dedicated team - comprised of the best drivers, market analysts and logistics experts in the industry - is equipped with industry-leading skills, training, and technology. Together, we're ready to move your business forward. Energy is always on the move at Solar Transport. 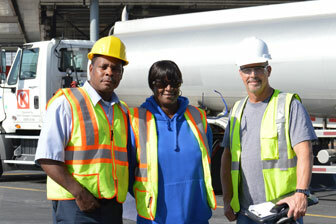 Our driver associates are among the most skilled, experienced and well-trained in the industry. They are a cut above the rest - because they have to be. There's no room for error when transporting and delivering refined petroleum products like gasoline, diesel, ethanol, and jet fuel. Our driver associates deliver and set a higher standard; they undergo specialized training to master the skills, technology and safety programs needed to transport and deliver these products in a safe, efficient and timely manner. In addition, our dedicated staff provides 24/7 support and a host of supply chain management services for our customers - from fleet support to inventory management - using custom solutions to keep your business running smoothly and profitably. Solar Transport goes beyond transportation. We are energy in motion.